Coming off of a 10-3 season with a second place finish in the Big 12 and a Cotton Bowl appearance, Kansas State has a lot to look forward to for the upcoming 2012 football season. Returning on offense is preseason Heisman contender quarterback Collin Klein, as well as top receivers Chris Harper and Tramaine Thompson and starting running back John Hubert. Returning on defense the 2011 Big 12 Defensive Newcomer of the Year Arthur Brown and Walter Camp All American Nigel Malone, as well as many other starters. Sophomore Wide Receiver Tyler Lockett looks to come back from a lacerated kidney that sidelined him for the last four games of the season. Despite this injury, the true freshman was named a consensus All-American Kick Returner. There was one coaching change in the offseason as former Defensive Coordinator Chris Cosh took the same position at South Florida. Head Coach Bill Snyder promoted Defensive Backs Coach Tom Hayes to Defensive Coordinator. As you can see, Kansas State has many pieces in place to make a run at a Big 12 and possibly even National Championship. 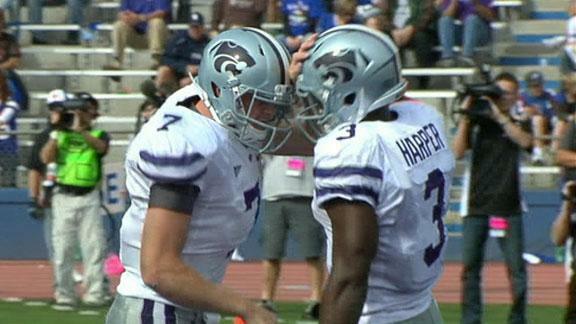 As Spring Practice has arrived for Kansas State, here are players to watch for the spring. Although Klein had an exceptional season last year, many questioned his ability to throw the football. It will be interesting to see this spring how much progress Collin has made in the offseason regarding his passing game. If Klein can get his passing game to an optimal level, combined with his ability to run the football, this will be one of the most explosive offenses in the country and Klein will be a Heisman Finalist come December. He has the weapons on offense to lead this team to a conference championship. The Blinn Junior College transfer came to K-State last year with aspirations of being a quarterback. However, Collin Klein took that job and did let anyone come close to taking it from him. During the practices leading up to the Cotton Bowl, Justin Tuggle made the switch from quarterback to outside linebacker, hoping to get a head start on taking a spot that is open with Emmanuel Lamur graduating. It will be interesting to see how far Tuggle has come since last December. He certainly has the physical tools to put it all together. His father was an All-Pro Linebacker for the Atlanta Falcons, so he has it in his blood. I’m excited to see if he can put all the pieces together. Coming into last year, Tyler Lockett was hoping to redshirt and put on some weight to possibly break into the rotation a wide receiver this year. However, after seeing him practice last summer, Wide Receivers coach Michael Smith thought Lockett could help K-State out immediately. Boy was he right. Lockett turned out not to only be a force on the offensive side of the ball, he was also a force on special teams. As a true freshman, Lockett was named a consensus All-American Kick Returner. During the game at Oklahoma State, Lockett took a punishing hit to the kidney as he was crossing the goal line. He ended u with a lacerated kidney that kept him on the sideline for the remainder of the season. Tyler is reportedly ready to go for spring ball, so it will be interesting to see if he can reproduce last years success despite the kidney injury. This entry was posted in Football, Football, Home, Midwest, National, Uncategorized and tagged Coach Snyder, Collin Klein, Kansas State Football, NCAAF.